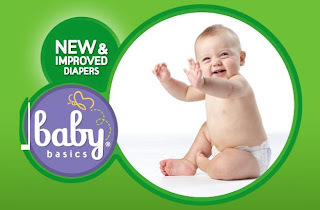 Head over to Think Baby Names and print off a coupon for $4 off Baby Basics (Albertsons store brand) diapers. Look at the lower right for the square ad — looks similar to the one at the top of this post. There’s a small yellow rectangle at the bottom left of the ad that says “Print $4 Coupon.” You may have to refresh the page a few times for the $4 off ad to appear. The coupon starts printing once you click on the ad, so make sure your printer is ready! I think there may be unlimited prints on this one — I’m on my third print. Thanks for the coupons! I used them last night with no problem. The Baby basics diapers are on sale for 7.99 right now,normally 9.99.The cashier did want to know where I got the coupons from because he wanted to print some of his own.I sent him here. Hi friendly cashier from last night! I only got two as well..but still great. When it says minimum purchase of 7.00…I assume that means on these diapers right?? Mine didn't have numbers under the bar code either. I wonder if it is because it is a store coupon? I noticed the bar code had no numbers underneath it. Did anyone else have it blank where the bar code number should be? Thanks! I only got 2, but still will make a good deal! It is a banner ad at the top of the page. hmmm, i refreshed like 10 times and know "secret box"! Holy cow, awesome coupon! Thanks for the heads up. I've actually gotten a few packs on clearance when I'm there at the right time. Crossing my fingers for a smoking deal, thanks again!